5 x 7 Tilting Table. Cast iron heavy duty construction. 0 - 90° range (45° each way). 5 x 7 Ground working. Supplied complete with crank handle. Settings locked by 2 screws. Graduated in degrees for quick setting. We will arrange the return or credit. 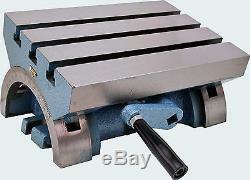 The item "5 x 7 Tilting Table for Milling Machines" is in sale since Tuesday, February 18, 2014. This item is in the category "Business & Industrial\CNC, Metalworking & Manufacturing\Workholding & Toolholding\Workholding\Fixtures & Plates". The seller is "toolprecision" and is located in Schaumburg, Illinois. This item can be shipped to United States, Canada, United Kingdom, Denmark, Romania, Slovakia, Bulgaria, Czech republic, Finland, Hungary, Latvia, Lithuania, Malta, Estonia, Australia, Greece, Portugal, Cyprus, Slovenia, Japan, China, Sweden, South Korea, Indonesia, Taiwan, South africa, Thailand, Belgium, France, Hong Kong, Ireland, Netherlands, Poland, Spain, Italy, Germany, Austria, Israel, Mexico, New Zealand, Philippines, Singapore, Switzerland, Norway, Saudi arabia, Ukraine, United arab emirates, Qatar, Kuwait, Bahrain, Croatia, Malaysia, Chile, Colombia, Costa rica, Dominican republic, Panama, Trinidad and tobago, Guatemala, El salvador, Honduras, Jamaica.